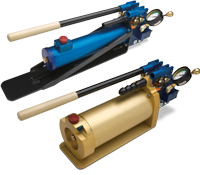 Mustang “H” and “ML” Series Hydraulic Squeeze Tools use a pilot operated cylinder locking valve. This specially designed valve assures the permanent locking of the hydraulic cylinder in the compressive squeeze-off mode. It automatically locks the cylinder and does not require the operator to remember to close a conventional valve. Upon completion of the squeeze-off, the double acting cylinder is retracted after unlocking the valve hydraulically. 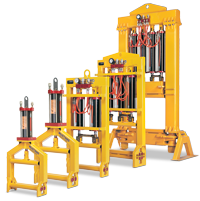 Mustang design and manufactures Hydraulic Hand Pumps with non-conductive high-pressure hose assemblies to power hydraulic tools. Hi-Flo Quick Disconnect couplings permit positive connection using a threaded sleeve. 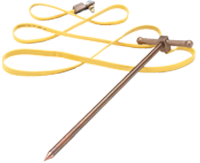 Mustang’s static electric discharge grounding device is manufactured from solid copper and bronze for maximum conductivity. Attachment to the upper jaw’s grounding lug provides the optimum path to ground if a static charge builds and discharges through the pipe/tool.